A field trip was conducted on January 8th to 9th, as a highlight of this semester’s program activities. 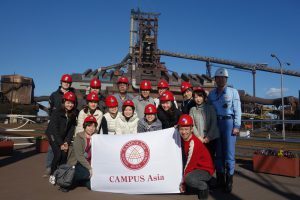 CAMPUS Asia Students from The University of Tokyo, Peking University and Seoul National University and faculty members visited Chiba Prefecture. The main concept of the retreat this year was to focus on the prefecture’s public policy, economy, and industry. We visited Narita Airport and Community Historical Museum, Narita International Airport Corporation, and Nippon Steel & Sumitomo Metal Kimitsu Works. 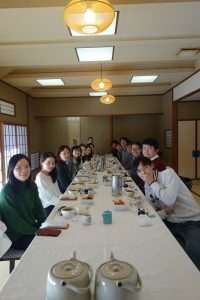 During the discussion session, the participants were split into three groups, representing China, Japan, and South Korea, and were able to extend their knowledge from various perspectives by sharing their opinions based on what they had actually learned through the sight visits. Blessed with nice crisp weather, we drove down Boso Penisula with a view of Mt. 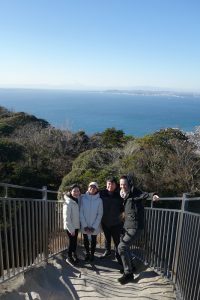 Fuji and were able to enjoy strolling in Nokogiriyama mountain and Nihonji-temple, as well as experiencing a large hot spring facility unique to the area. While deepening relationships between students and faculty members, the trip reminded the participants of the purpose of the program, which ended to be a fruitful event.